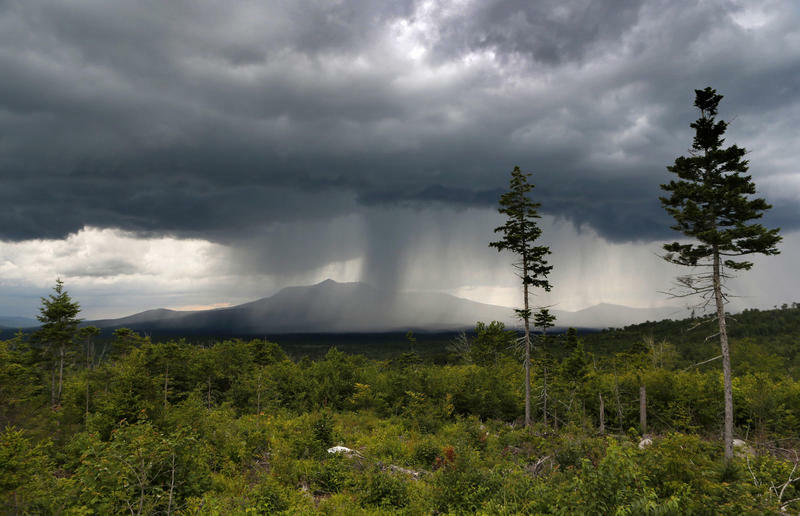 A rain storm passes over Mt. Katahdin in this August 2015 view from land that is now the Katahdin Woods and Waters National Monument in northern Maine. It has been 18 months since former President Barack Obama designated the Katahdin Woods and Waters National Monument in northern Maine — but there are still no road signs to direct interested visitors where to go or how to get there. Republican Gov. Paul LePage made headlines last year when he forbade the placement of signs pending the outcome of a review by the Interior Department. That review was completed months ago, and the signs are expected to be erected soon. Wendy Sairio, director of the Katahdin Area Chamber of Commerce, says it has been frustrating for tourists who want to visit the new monument. For some would-be visitors, the famous Maine saying “You can’t get there from here” seems to have been true. “We’ve had a lot of people come in having missed the turnoff to go up to the monument on Route 11 because there is no signage. And there’s no signage on the highway off of I-95, for exit 244 or 264, either one of which will take you to the loop road of the monument,” she says. Sairio says the lack of signage has also been disappointing for local businesses hoping to cater to tourist traffic. At one point last year a homemade sign advertising the monument was erected, but state officials quickly had it removed. LePage has been one of the leading monument opponents, once famously referring to the region as a “mosquito-infested wasteland” that had been heavily forested, and testifying against its creation at a congressional subcommittee hearing last May, where he was asked whether he could see the monument’s potential economic benefits. “Not in this area. Not in my lifetime. Not until this forest grows up again,” he said. LePage had hoped a review by Interior Secretary Ryan Zinke would undo the monument’s federal designation, but that didn’t happen. The governor’s press secretary says visitors to the region can now expect a little assistance on the road. “Maine DOT is working with the Park Service to expedite the production and installation of the signs,” says Julie Rabinowitz. Rabinowitz says the change of heart was the result of Zinke’s completion of the monument’s review, his decision to keep the monument intact and a new request from the National Park Service to erect road signs in several key locations. Rabinowitz says she expects the signs to be up in time for the summer tourist season. That’s welcome news for Andrew Bossie, executive director for Friends of Katahdin Woods and Waters. “The region definitely needs economic activity and people were hopeful that Katahdin Woods and Waters National Monument would be part of the solution to how to rebuild after mill closures in the region, and anything we can do to drive visitation up there is a win in our perspective. So, we’re delighted to hear that signs will be moving forward and we’ll stay vigilant on making sure that that happens,” he says. In its first year, Katahdin Woods and Waters attracted nearly 30,000 visitors. Supporters expect that number to increase now that the monument’s status is no longer in question and signs directing motorists how to access it are in place. BENEDICTA, Maine - Supporters of a new national monument in Maine who are upset at the governor's refusal to allow road signs for the park are taking matters into their own hands. Fans of Katahdin Woods and Waters National Monument hung a banner advertising the park from a highway overpass above Interstate 95. The sign, which appears to be written on a bed sheet or piece of canvas, says "KWW Exit 264'' and appeared Wednesday.